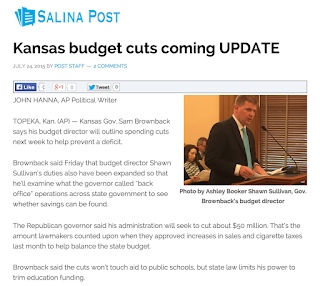 Last January, Sam Brownback was trying hard to shift the blame for an expanding state budget crisis. Referring to the 2012 Kansas income tax cuts, he told the Topeka Chamber of Commerce, “What I got from the Legislature was a naked tax cut with none of the pay-fors." But in 2012, Brownback did not admit any misgivings. He happily signed the income tax cut bill, the most consequential act of his governorship and the beginning of the so-called Kansas experiment. Until the state budget crisis hit, he trumpeted his decision as a shot of adrenalin to the Kansas economy. Now, three years in, Kansans and the nation are realizing how high the costs of our tax experiment have been. The income tax cuts were indeed not free. “Pay-fors” have definitely been required. The most visible pay-fors have been tax increases. The 2012 income tax cuts blew such a hole in the state budget that lawmakers had no real choice during the 2015 legislative session but to raise taxes somewhere. They chose the sales tax, cigarette tax, and a few others. The state sales tax has increased to 6.5 percent, and only Mississippians pay a higher sales tax rate on food than Kansans. Unwilling to challenge a veto threat from the governor, legislators could not correct the income tax policy that unfairly gives huge tax cuts to some of the wealthiest, but still requires working Kansans to pay. The income tax cuts have also been paid for by cutting back state services. The most prominent example is the switch of school aid to a block grant formula. The block grant lowered classroom funding and then froze that diminished funding in place for the next two years. The block grant was not implemented because it was a better, fairer way to distribute funds. Rather, the key purpose was to put a chokehold on school finance in order to make up for a portion of the revenue loss from the income tax cuts. In response, school districts have shortened their school year, chopped programs, and raised property taxes. And in ongoing school finance litigation, the Kansas district court has already ruled the block grant system inadequately funds schools, thus violating the state constitution. One of the biggest costs of the Kansas experiment, although not as easily quantifiable, has been stagnation. With the state in financial crisis, all thoughts go toward surviving the chaos, pulling back, and making do. The Kansas political environment currently offers no capacity to consider questions like: How do we make our schools world-class? What are the next steps for our road system? Can we improve the health of our citizens? Progress requires a stable budget and fiscal situation which Kansas still does not have. While Kansas lawmakers were spending a record-long legislative session agonizing over finances, other states were thinking about their future and passing us by. The pay-fors have come into focus: Higher sales and property taxes. Cut-back services. Crisis-management politics overtaking future planning. What are the benefits? Did Kansas get anything for all these pay-fors? The Brownback administration cites economic statistics that show the Kansas economy has been growing. That’s true. Kansas has been on a slow economic path upward, but below the national average. Other states that did not apply tax cuts have been growing faster. The tax cuts did not give the Kansas economy any kind of measurable positive jolt. Instead, Kansans have been on the receiving end of a lot of pay-fors. The 2015 legislative session is over, but next year lawmakers have another chance to put Kansas on a better path, by ending an experiment that has already cost us dearly.